A full entry of 65 cars plus 9 travelling marshals had been received by the Cirencester Car Club for the 11th running of their Corinium Run. This event was the second in the HRCR Scenic Tour Series sponsored by Clayton Classics. The event itself had also received sponsorship from Thornley Kelham, a company based in South Cerney who specialise in the servicing and maintenance of Classic and Vintage Cars www.thornleykelham.co (a very interesting website). A big thank you to both these companies for their generous support. As usual with this run, the attention to detail in the pre-event paperwork was superb. Very detailed maps and a timing schedule were included in the Finals to ensure there were minimum queues at the filling station where all the cars’ fuel tanks were filled under the guidance of the watchful marshals - no cheating allowed here! From petrol, there was just a 1.3 mile run to the new start venue at the Corinium Stadium - the home of Cirencester Town Football Club. There was an optional deviation on this short section to where the organisers had set up a measured mile for those entrants who wanted to hone their car tripmeters - another piece of fantastic attention to detail. On arrival at the arena, there was a massive car park to swallow up all the cars, but once again very efficiently marshalled by the club members. Signing on went very smoothly with no queues and then there was time for the breakfast roll or a full English breakfast for those who did not mind carrying the extra weight! Remember - we are trying to drive economically today and every little bit helps! Breakfast over, there was now time to delve into the very comprehensive colour-printed road book that ran to 63 pages of maps and tulip instructions. Page 1 of the Road Book was a time schedule for all the main controls on the tour - another great help to newcomers on the tour scene. With a wave of the Union Flag, Car 1 left the Arena at 09.30 hours on a beautiful spring sunny morning. We followed at 10.06, running as car 37. Leg 1 was from the Stadium to Northleach and the first village we passed through was Preston, which had an abundance of houses to die for. Next came Down Ampney, an area well known to the single-venue rally crews who compete on events here. Next came Poulton and a crossroads called Betty’s Grave! The road book explained that there is a legend of Betty being a Gipsy princess who was buried there. And flowers still appear on the spot, but the mystery is - who puts them there? Ampney Crucis and Lower Chedworth were two more charming Cotswold villages to be driven through and the golden Cotswold stone of the houses looked glorious in the morning sun. Next on the route was Yarnworth, with its rolling hills and then Compton Abdale with stunning views. 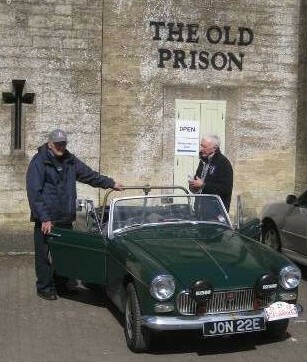 The first halt of the day was at the 1790’s Northleach Prison, now known as the Cotswold Lion Café. Leg 2 would take the route from Northleach to Witney, going via Farmington, Sherborne, Windrush and Little Barrington. Here we left Gloucestershire behind and entered Oxfordshire, with some stunning views over the rolling hills and the blackthorn hedge blossom making a delightful picture. We then traversed Burford, another superb small town that was very busy with many tourists, but we were soon back out into the country roads, leaving the Burford visitors to enjoy their day. At Swinbrook Farm, we left the public highway to have the car and crew weighed ready for the results to go forward to the team to calculate our driving efficiency. Back in the quiet country roads, we travelled through Ascott-u-Wychwood, Field Assarts and Crawley to arrive at the lunch halt in the centre of Witney. The intricate route to the town centre car park gave the entrants a wonderful taste for this charming town. Level 5 in the multi-storey car park was a great place for the terrific array of old cars to be parked and they did attract a lot of local interest, whilst bringing back many memories of starting road rallies in the 60/70’s from similar venues as well as autotests that were run in Birmingham car parks by the local motor clubs. After an hour and a half’s rest, the travelling marshal allowed us to leave Witney on our due time of 14.33 hours. Leg 3 would take the tour route northeast from Witney, passing through New Yatt, North Leigh and Ramsden to the historic village of Minster Lovell. In the area of Akeman Street, the roads were quite steep and not good for those mpg figures - but would make superb night rally sections! More exquisite villages were passed through on our way to Southrop - a real charmer. Another gem came next - the historic inland port of Lechlade-on-Thames and a further 1.5 miles brought the crews to the wonderful Lechlade Garden Centre. This last rest halt of the day was quite a worry to the male crew members as there were too many nice things on offer to tempt the ladies! Once again the marshals kept the cars in order, doing a great job of ensuring no convoys of cars through the lanes. Leaving Lechlade behind, we passed by the Cotswold Water Park – a very popular visitor spot - and then onto RAF Fairford that was a base for the United States Air Force until 2010. On the outskirts of Fairford, we drove along a stunning road with fantastic water scenes. Another tourist gem came next – Bibury, famed for its trout farm and pretty cottages. Outside Bibury, driver Mike asked the question, “How much further have we to go?” The reply from Hilary was, “Three pages!” (Could this become a new way of measuring distances on tour events?!) The route then took in more very interesting roads through Ablington, Winson and Coln Rogers to return the crews to the start filling station for the good - or bad - news. Again, the very efficient marshalling soon had the tank seals removed and the cars refilled with liquid gold. A short run took the cars back to the Corinium Stadium for a well-earned afternoon tea and coffee break. There was now time to sit with the other entrants and discuss the day’s activities whilst we awaited the printing of the efficiency certificates, each including a colour photograph of the car, taken on the tour. 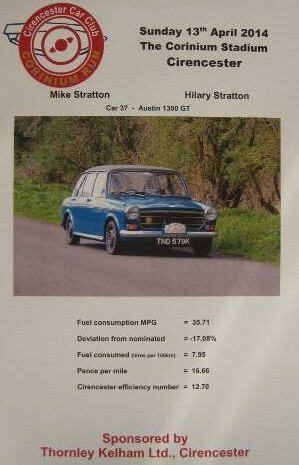 We had elected a figure of 30.5mpg for Dippy and he recorded 35.71mpg, despite running short of breath on some of the hills! In closing, we would like to thank Martin, Simon, Sam and all team who put on a fantastic, value-for-money 124-mile tour of the Cotswolds - and they had even organised excellent weather! 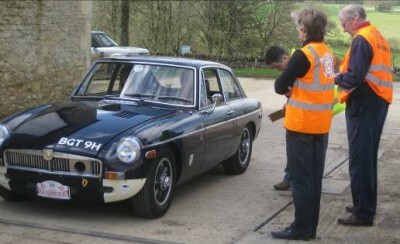 For further information on similar tours, log onto HRCR Scenic Tours and www.classictourdiary.co.uk. Our sincere thanks to Peter Fieldhouse for all his help in editing and proof reading this report. 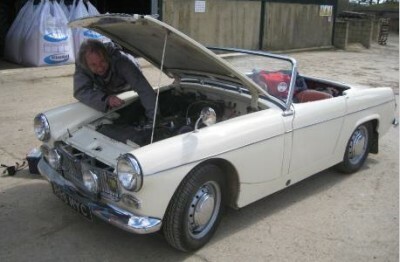 2004 saw Cirencester Car Club Ltd promote its first Touring Assembly and Economy Run. The event was very well received by participants who enjoyed a scenic tour through many of the traffic-free roads that are to be found in the Cotswolds, once clear of the main highways. In the intervening years, the Corinium Run has grown to become one of the most popular events in the Scenic Tours calendar; a prompt entry is advised to avoid possible disappointment. Starting and finishing near Cirencester, the run takes in the pretty villages and the dry-stone walled majesty of the Cotswolds as it covers approximately 100 miles on a tulip roadbook. Normally split into several sections, with route checks and a lunch halt, opportunity to stop and pose for photographs or stop for a picnic. As well as asking participants to nominate the economy figure that they expected to achieve (and calculating the deviation from this target) the organisers resurrected the efficiency formula pioneered by the Mobilgas Economy Runs of the 1960s and 1970s as an incentive to drive as economically as possible. This formula involves the vehicle running weight (including the crew). A finisher's certificate recording the crews achievements and a photograph of the car somewhere on the route is presented to each team at the end of the run. Petrol or Diesel powered cars of any age can enter the Run.